Our 2014 remodeled home is a spacious 3 bedroom, 3 bathroom home located just 50 ft from the dunes of the Atlantic Ocean. It is truly a 5 star home. Whether your planning a family vacation, a 'couples week' or just getting away from the cold weather in the winter, you will find that this is the perfect vacation rental. Our beach offers something for everyone. Surf fishing, swimming, surfing, shelling and if you plan your trip between April & October you will be treated to watching giant Loggerhead & Leatherback turtles laying their eggs in the sand dunes every evening. Our shores are the largest egg-laying grounds in the world! Just 1 hour to Disney World & 35 minutes to Kennedy Space Center. Spring time visitors can watch the Washington Nationals Spring Training Camp. Golf courses galore! If you are interested in a modern 2014 totally remodeled vacation rental that is steps from a beautiful beach then this property is for you! If your planning a family vacation or a couples weekend you will all have the privacy of 3 bedrooms and 3 full bathrooms. Great ocean views. 50 Feet to Ocean. Best Beach in Florida. The bathrooms were totally remodeled in 2014 including all new vanities, tile and fixtures. 5 Star towels are included. The Beach is the best in Florida. The state totally restores the beach every 5 years. No coral stones here. HISTORIC DOWNTOWN MELBOURNE IS A GREAT PLACE TO SHOP AND DINE. ONLY 2 MILES FROM THE TOWNHOUSE! Steps away from the beautiful sandy dunes and beach. 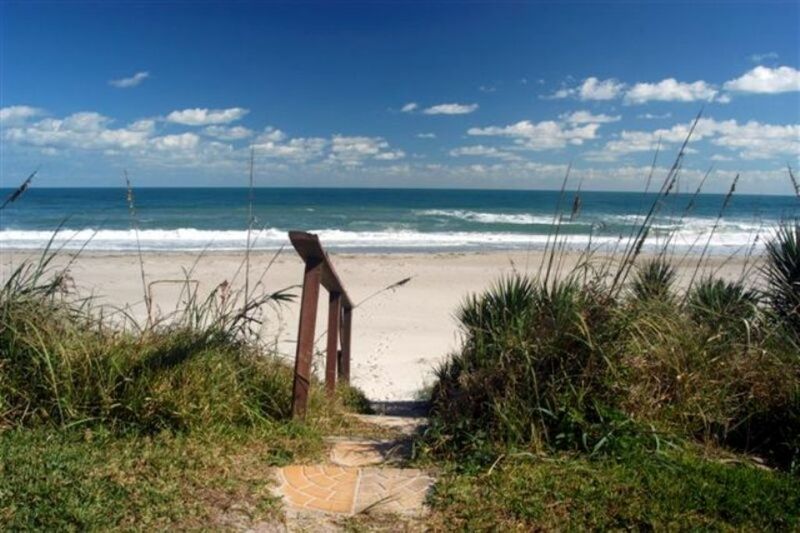 You can walk directly through the backyard onto the sandy beach and the amazing Atlantic Ocean! Beautiful view from great room and master bedroom. Private patio and deck. 5 star ... but bring your own beach towels. All new plates and silverware and pots and pans are included. All TVS are new. There are 4 of them. One in living room and one in each bedroom. Beautiful grass area between the patio and the sand dune. Just 2 miles to municipal golf course. We do offer a Pack 'n Play for our infant guests! Casa Do Re Mi exceeded all expectations. From the moment we arrived until the moment we left all we could think was WOW! As soon as you enter Casa Do Re Mi you are faced with the most amazing view of the Bay of Banderas. The experience only gets better as a smiling Ivan promptly supplies the most delicious Margaritas. Ivan then invites you to sit down for a welcome dinner. The meal, prepared by Chayo, is, as every meal that followed, absolutely delicious. On the following days Ivan helped arrange activities, supplied refreshments and kept the garden and pool tidy. Chayo prepared a succulent breakfast and dinner that we picked the day before. Sarah kept the house spotlessly clean. They made sure at every turn that this bear family had the best time possible. Casa Do Re Mi is built in the style of a Mexican hacienda. The attention to detail in its decoration and upkeep is remarkable. The finely furnished indoors and outdoors provide everything you need to relax and enjoy the all-surrounding spectacular ocean views. Everything is beautifully maintained. That attention to detail is also displayed by Barb the owner with her guests. We had a conversation prior to departure on the phone to go over Casa Do Re Mi. She asked us which beverages we’d like to be there for our arrival. She called us to check that everything was going well. In short, she cares about her guests having an unforgettable experience. Across the street from the villa we relaxed and swam at the beach. The house has plentiful towels and beach toys that our bear family enjoyed. The hotel Lindo Mar across the street has an elevator for easy access to a beautiful beach with calm waters that our little bear particularly enjoyed. We spent a lot of time swimming and laughing at the pool. Our time there was made better by Ivan’s constant supply of refreshing beverages. After fantastic dinners and deserts we were treated to mesmerizing sunsets. Our bear family has been to many places around the world but Casa Do Re Mi will forever be one of our favorites! This condo didn’t look like much when you pulled in the street side, but is it 1) adorably updated and decorated with a beachy theme, 2) clean, convenient and comfortable, and 3) has the BEST VIEWS of and access to the ocean. Walk across the grass and down a short path and you’re at the beach. The host included beach chairs and many pluses to make the stay comfortable. We hope to stay again! The location is perfect, right on a beach that was uncrowded even though we stayed during Spring break. Just a short walk out the patio and you’re on the beach. We really liked being able to leave our chairs and umbrella set up all day, going back and forth for lunch and to the bathroom. The view from the upstairs balcony of the ocean is beautiful. The location is convenient to shops, restaurants and grocery stores. There were beach chairs, umbrella and boogie boards in the garage for us to use. Also, there were trash bags, paper towels, paper plates, toilet paper, soaps and dish detergent, which you normally don’t find in a vacation rental. The condo was nice and clean and had been nicely remodeled. The patio was great for sitting outside, listening to the waves, with a table and chairs where we ate lunch most days. The living room sofa was sagging and had books under the legs to hold it up. After sitting on it for a short time, our backs would ache. Johnny Valentine, the owner, stopped by at the beginning of our stay to ask if everything was ok. I told him about the sofa. He brought an extra chair over from the condo next door and told me he would be ordering a new sofa, but it of course wouldn’t be there during our stay. He said no one else had ever complained about the sofa. That night, we ran the dishwasher — or at least thought we had—but the dishes were still dirty in the morning, so I washed them by hand and sent Johnny an email thinking he would send someone to look at the dishwasher. He came a little later and cleaned the drain and told us we had to slam the door shut really hard to get it to work. He has another dishwasher in the garage to replace the one in the kitchen and said he would be replacing the dishwasher but not that week. The dishwasher worked better afterwards but I would advise not running it at night because it is very noisy. Also, there were only 4 coffee cups and limited bowls and plates, so we had to run it daily with 4 of us staying there. When Johnny stopped by the 2nd time, he offered to refund my money and we could look for another place to stay if we couldn’t make do. I had no desire to try and do that, it would have been a lot of work for one thing, and probably about impossible during Spring break. The location and the beach outweighed the negatives of the sofa and the dishwasher, although I hope they are replaced soon. Thank you for your review. We have instructed our cleaning service to please make us aware of issues needing repair in our townhome. All of your concerns have been addressed. Thank you for bringing them to our attention and we hope you will visit our fabulous location soon. We had a wonderful time at this rental. The location couldn't be better and the accommodations are really comfortable. The view from the upstairs balcony is beautiful. On the beach! Clean comfortable. Just a few steps to the uncrowded beach, and the small grassy area off the patio was convenient for our small dog. Plenty of good restaurants nearby if you don't want to cook. The house was very clean and had comfortable beds. Two of the dining chairs appeared to be "outdoor" chairs, which was strange. Great balcony off the master bedroom!!!! Bathroom photos were not the ones in this unit, must be the ones next door (same owner). Two of the 3 bathrooms were very nicely finished. The only disappointment was local law that required no lights after dark on the beach side of the house, because of nesting sea turtles...which meant no lights on the patio or open curtains after dark. Perfect get away to relax . We had a great time on Melbourne beach and loved the townhome . It had everything we needed and Johnny was great to work with and stopped in to make sure everything was perfect . Highly recommend this to anyone needing a relaxing week on the beach . Walking distance to Starbucks coffee, Cold Stone ice cream and many local restaurants.